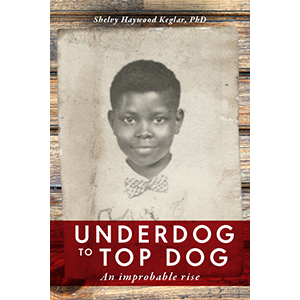 Underdog to Top Dog is a candid, inspiring story offering a wellspring of inspiration to anyone struggling to answer the question, Can I Do It? Shelvy Haywood Keglar, raised by a single mother, living in poverty, never knowing his father, and experiencing racism firsthand, overcame his challenging reality to become the successful clinical psychologist and businessman he is today. The book transcends one man’s pragmatic and spiritual journey to offer a universal message of hope. Dr. Keglar sheds light on how you can live a more meaningful, productive, and satisfying life. This unique story culminates in a final chapter that offers a dynamic, self-reflective course of action that individuals, teachers, and community and business leaders can use to gain new insights and to motivate themselves and others. Dr. Keglar has become the voice for the African American community and one of the most successful professionals in the US for mental health services for the many neglected children and vulnerable populations of our nation. Anyone who reads his book will be inspired by his journey of vision and courage.